A reliable source for Coin Bank information and a resource for accessing leading Coin Bank and suppliers. Cardboard coin banks are a type of sealed paper tube or cylinder which are constructed with a slot in one end and are used to collect change and cash. A common use for cardboard coin banks is to gather donations for charities and non-profit causes by placing the coin banks at prominent locations within stores or at an event. Other uses include piggy banks, children’s savings banks and special funds savings containers. Coin Bank Cardboard coin banks are a type of sealed paper tube or cylinder which are constructed with a slot in one end and are used to collect change and cash. A common use for cardboard coin banks is to gather donations for charities and non-profit causes by placing the coin banks at prominent locations within stores or at an event. While coin collecting tubes are also often made of plastic, cardboard offers a highly versatile material for this purpose. The tubes are able to be pre-printed with labels and logos or designs, therefore allowing the tubes to have a potential dual purpose of collecting money and advertising for a cause or organization. 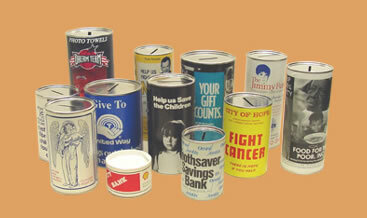 Coin Bank - Marshall Paper Tube Company, Inc. The coin banks are not made too big, and typically have a diameter of about 3 inches with a height around 5 inches. Money, especially coins, can be very heavy, and the semi-strong cardboard walling can only hold so much weight. Therefore, the size is restricted to ensure the tube does not break. Some coin banks can be shipped flat with the plugs and assemble as and when needed. These are not likely to be the most durable tubes as the cardboard will be thinner, but can be useful for short term use. When tubes are no longer being used either because they have been damaged in some way, or because a permanently sealed tube has been opened, they are able to be recycled in the same manner as other cardboard items. The relatively low costs of manufacturing and labeling cardboard coin tubes make them an excellent solution for community, church or office charity drives.